The Anti-Defamation League has slammed Noway's prime minister over failing to condemn anti-Israel slogans at the country's May Day event. Prime Minister Jens Stoltenberg, head of the governing Labour Party, was silent in the face of official anti-Semitic and anti-Israel banners. 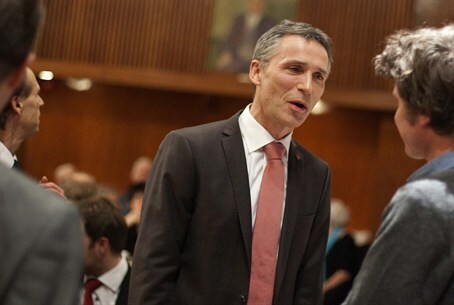 Stoltenberg did not comment about the slogans, though he was the featured speaker at the May Day celebration of the Norwegian Confederation of Trade Unions (LO) in Bergen. "It is extremely troubling that given the nature of these anti-Israel slogans, their official status at the parade, and the fact that they were written about by newspapers days before the event, Prime Minister Stoltenberg still participated and did not speak out against these vile, offensive statements,” said Abraham H. Foxman, ADL National Director. The ADL said in a letter to Stoltenberg it was disturbed by his decision to participate in the event and was dismayed he had not denounced the slogans.